Acting Pentagon chief Patrick Shanahan made an unannounced visit to the Iraqi capital on Tuesday for talks on the sensitive issue of a continued US troop presence after Washington withdraws from neighbouring Syria. Shanahan is keen to reassure Iraqi leaders after President Donald Trump angered many by saying he wanted to maintain some troops at the Al-Asad airbase, northwest of Baghdad, to keep an eye on Iran. The acting defence secretary, who flew in from Afghanistan on his foreign tour since taking office last month, was due to hold talks with Prime Minister Adel Abdel Mahdi and top military advisers, as well as Lieutenant General Paul LaCamera, the commander of anti-IS coalition forces. 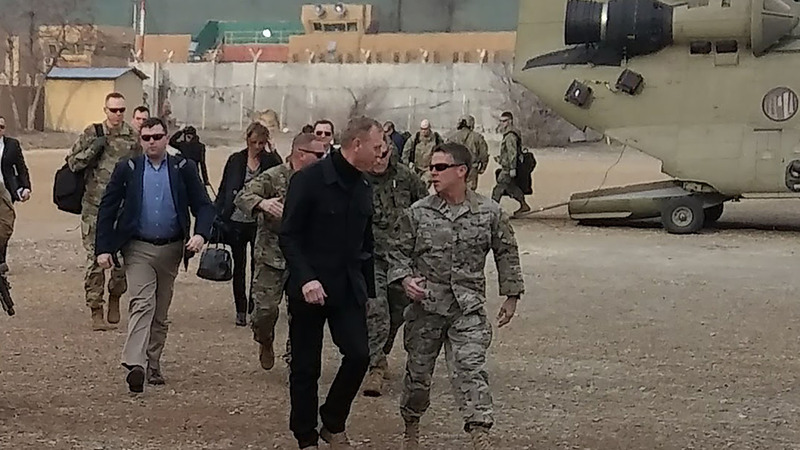 “Our main partnership and military activity in Iraq is the de-ISIS (IS) mission,” a senior Pentagon official told journalists travelling with Shanahan, keeping the focus on the fight against Islamic State jihadists. Washington was also pressing its allies to repatriate their nationals captured and taken prisoner after fighting fought for IS in Iraq and Syria, the official said. “We think coalition members need to take responsibility for their citizens who are fighters. It’s been a message we’ve delivered time and time again. And we are seeing hopeful progress,” he said. The plan, judged hasty by both US allies and senior figures within Trump’s own administration, prompted the resignation of Shanahan’s predecessor, Jim Mattis. But with US-backed Kurdish-led fighters poised to overrun the Islamic State group’s last tiny enclave in eastern Syria, perhaps as early as this week, the withdrawal, which other administration figures had managed to slow, is now likely to gather pace. Trump’s comments about the al-Asad airbase came after the US president had already angered Iraqi leaders in December by paying a Christmas visit to US troops based there without travelling to Baghdad to talk with them. “We spent a fortune on building this incredible base. We might as well keep it,” Trump said in the CBS interview. “One of the reasons I want to keep it is because I want to be looking a little bit at Iran because Iran is a real problem,” he added. It is backed by both of Iraq’s most powerful political groupings, the nationalist alliance led by radical Shiite cleric Moqtada Sadr, and the pro-Iran movement of former anti-IS fighters. At a rare joint news conference on Monday, the two groupings demanded at the very least a “new agreement” setting tight conditions on any future foreign troop presence. Following the US-led invasion that overthrew since-executed dictator Saddam Hussein in 2003, US troop numbers peaked at some 170,000 before a full withdrawal was completed in 2011. Troops returned to Iraq in 2014 as part of an international coalition set up to fight IS after it swept through much of the north and west as well as swathes of neighbouring Syria that year.